Camping is tons of fun for kids of every age, but when you can’t get out in the woods, how about bringing the campout to your own backyard? I have only gone camping for real twice in my life. But I have all of the equipment. And I know that every kid enjoys sleeping outside and doing some of the traditional camping activities, even if the house is only a few feet away. Erect your tent and pile in the sleeping bags and pillows for all the campers. If you don’t have a tent you can even sleep under the stars. Just be sure to put a tarp or cushiony blanket under your sleeping bags to keep the moisture from the ground from getting into your sleeping bags throughout the night. 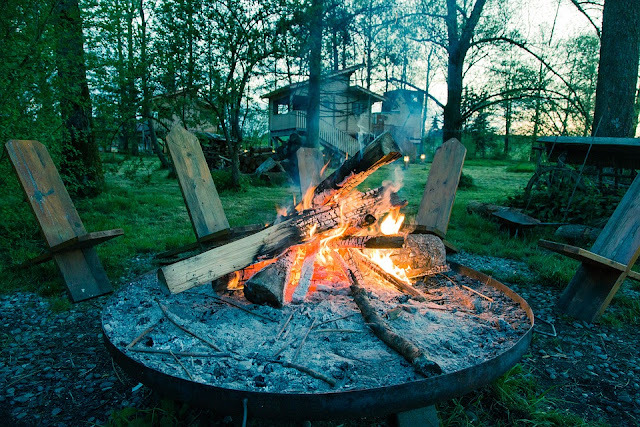 If you have a fire pit, you have most of what is needed for this fun glamping adventure. Having a warm, toasty fire is one of the things camping activities revolve around. If you have a fire pit to use that’ll make the activities more authentic and fun. Be sure to check the laws in your area before building a bonfire, because some municipalities regulate the use of fire pits. My daughter loves that she gets to prepare a dinner of fire roasted hot dogs. If you don’t have hot dog sticks you can make your own out of a switch from a tree. Cut any twigs off the body of your stick and sharpen the end to a point. Put your hotdog on long ways – push the stick through the length of the whole hot dog. This will help ensure your hot dog doesn’t fall into the fire. My husband stuffs pepper for me with vegan cheese and roasts that and onions for me. It's a pretty easy way to get me interested in going into the back yard. After dinner it’s time to for some age-appropriate stories. On our normal grilling night we like to watch 'Ghost Hunters', so of course no camping trip would be complete without a few scary stories. Just make sure you don’t frighten the little ones, or they’ll be back in the house in no time, or in your sleeping bag. Before you settle in for the night, there’s time for one last tasty campfire treat. Two great desserts that are easy to make over the fire are S’mores and Banana Boats. We have found some great gluten-free and passover marshmallows to finally be able to make S'mores despite our food allergies. You don’t have to travel far or spend a lot of money to have some fun camping with the family. A simple tent pitched in the backyard, a fire pit, and a few snacks is a great way to “get away” for the evening and have some fun with the kids.